This comic was tagged built to last, comic, comic strip, comics, contracting, levins and young, tools, work life. We love how it all came together and owe a huge debt of gratitude to Christina Young, my wife and an artist in her own right, for all her hard work on the design of the cover and interior. It looks great! Many thanks also go to Scott Peterson for his wonderful intro. It is available now on Amazon and we are having an official launch event at the upcoming Tingfest Free Comic Book Day – Meet the Artists! day on May 7th. We will have copies for sale and you can meet us both in person between 2:00 and 4:00. Stop by and say hello! We’re working diligently to put together the first Levins and Young comic strip collection in paperback and would love some input on which title/cover you like better. Please take a look at the images above and place your vote for A or B in the comments section. Consider which title is better and/or which image is more compelling (or a combination of the two factors). Note: picture the finished product in higher resolution and glorious full color, of course. 🙂 Feel free to include your comments – we’re interested in anything our readers have to say about this. We will publish the results shortly, along with more details on the upcoming launch of our collection. Thanks, all! We ended up going with the oldest, largest and (arguably) most prestigious syndicate’s development offer. Can you blame us? The caveat was that the Editor in Chief wanted us to change our concept by about 50%. He liked the married couple stuff, but he wanted to change James’s profession from writer to contractor. This would appeal to people in the home renovations demographic and help the newspapers sell Home Depot ads. Syndication is a business – we got it. Thus began an eighteen month ordeal of writing endless new scripts, tweaking the concept, weekly faxes to New York, and a gradual diminishing of the editor’s interest and attention that ended in disappointment and no deal. At that point, disillusioned and demoralized, Tim and I shelved our comic stripping ambitions for good. For more on that story, in case you missed it in the comments on the FB page, here is Tim’s recounting of that story. But out of all that effort, we did produce a handful of completed strips in blue pencil sketch form which were never inked. We will be sharing them with you beginning in April. The blueprint design above references the contracting theme and also the relationship angle nicely, I thought. That was all Tim. 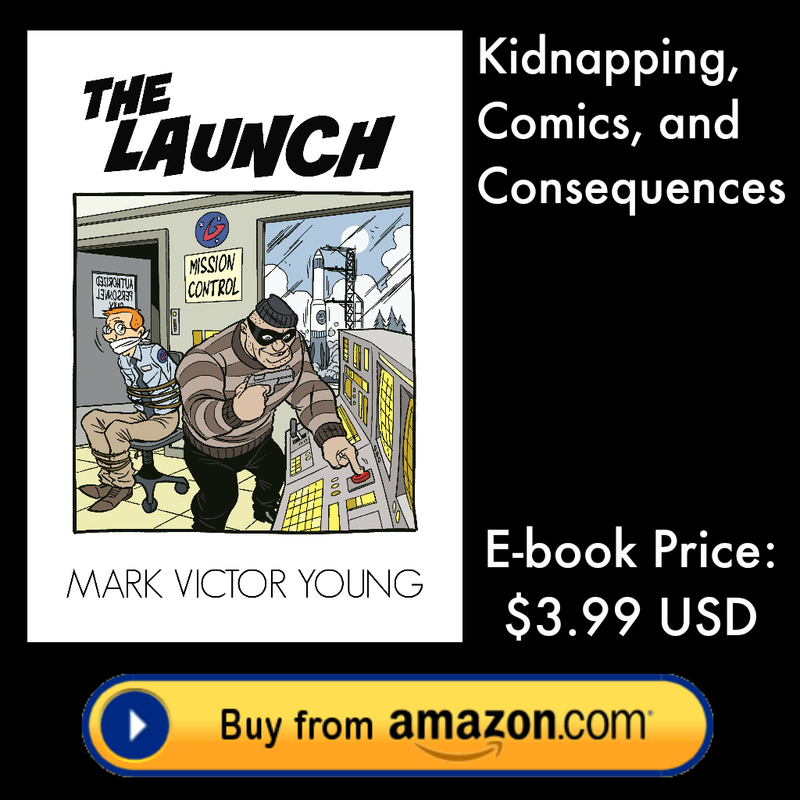 Not to mention that the whole experience became the inspiration for Mark’s novel, The Launch, which describes a what if? scenario of two frustrated cartoonists kidnapping the editor in chief and forcing him to syndicate their strip. I wonder where he came up with that idea? 🙂 Click here for more info. It’s not only a lot of fun, it’s also considered to be his best novel to date. So tune in next week for the start of Built to Last. Tell your friends! On the bright side, I saved the last Sunday strip for tomorrow to close it out with a big finish. Don’t forget to check in then! In the meantime, please enjoy Tim’s color experimentation version of the previous strip just because. We started posting our comics from the Levins and Young archives in early September. Since then, we’ve had about 120 people follow us on our website, facebook, medium, and lately on the comic app tapastic. Thanks so much for joining us on this trip down memory lane. We appreciate all 120 of you. If you’re enjoying our work, we would love it if you’d help us spread the word. A recommendation from a fan is worth more than anything we could ever say. Happy Sunday! Hope you’ve found time to relax with someone you love over the holidays.